Guernsey No. 7 (1965 - 1966). Easily picked out on the football field because of his shock of bright red hair, Johnny Kemp was a versatile contributor at Under 19 and Reserve grade for the Blues at the dawn of the Barassi era. Wearing guernsey number 7, he played six matches in two seasons on Carlton’s senior list in 1965-66, only to find the intensity required too hard to maintain. Born on D Day - June 6, 1944 - Kemp began his junior football at Pascoe Vale before joining Carlton’s Under 19 squad in 1962. In September of the following year, played across half-back as the young Blues destroyed Essendon by 38 points to win that season’s Under 19 Grand Final. A consistent year of Reserves football in '64 earned John his promotion to the senior team at last in round 1, 1965 – a pivotal moment in the history of the Carlton Football Club, because it marked the debut of former Melbourne champion Ron Barassi as captain-coach of the Blues. On that eagerly-anticipated Saturday afternoon, a ground-record 36,000 spectators packed into Hawthorn’s Glenferrie Oval to see the Baggers upset their hosts by 37 points. 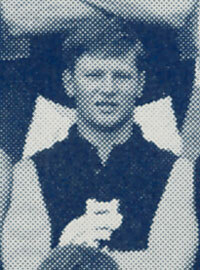 Kemp spent most of the match on the bench as 19th man, as he did the following week, when Carlton was narrowly beaten by Geelong at Princes Park. After waiting almost a year for another opportunity, Johnny was selected for four successive matches between rounds 11 and 14, 1966. He was tried in a variety of roles at half-forward and half-back, but just couldn’t cement his spot in the side and was omitted for the remainder of the season. At the end of that year, Barassi pruned his playing list with a heavy hand, and Kemp was among those who were told that their services were no longer required. Kemp wore guernsey No. 42 in 1964 whilst playing with Carlton's reserves team. Contributors to this page: Bombasheldon , molsey , PatsFitztrick , tmd1 , true_blue24 , p(12)terg , Jarusa and admin . Page last modified on Friday 26 of April, 2013 08:32:34 AEST by Bombasheldon.